During the Nintendo Switch reveal video in late 2016, a Mario Kart 8 release was hinted as the game was shown being played with Switch Joy-cons. Mario Kart 8 Deluxe was soon announced as a port from the Wii U, in what Nintendo calls the definitive edition of the game. For those that have not played Mario Kart 8 on the Wii U, the main mechanic of the game is the anti-gravity mode. Anti-gravity mode is triggered once you drive over panels with blue circles, and the wheels of the vehicle will turn to the side and bumping other vehicles will result in a boost, which also makes the racing more chaotic overall. Mario Kart 8 Deluxe comes with all the original and DLC courses and characters (except one) right out of the box. This is an excellent change as in the original MK8 it took a considerable time to unlock everything to get full access. The main modes in MK8D are Grand Prix, VS, and Time Trials. For Grand Prix, since the DLC is included, there are 12 different Cups in all, for a total of 48 courses, half of them are new and the other half are retro remakes. This is the largest Mario Kart to date, and gives the game considerable value. VS mode is a customizable versus mode, that lets you choose the item settings, CPU difficulty, number of laps and the course. Time trials are self-explanatory, race to set the fastest time possible. The biggest addition to the game is an enhanced battle mode where all the traditional elements are back and where the stages are battle style courses, with 5 new and 3 retro battle courses. There are four familiar battle modes from the previous titles: Balloon Battle, Bob-omb Blast, Coin Runners, Shine Thief. 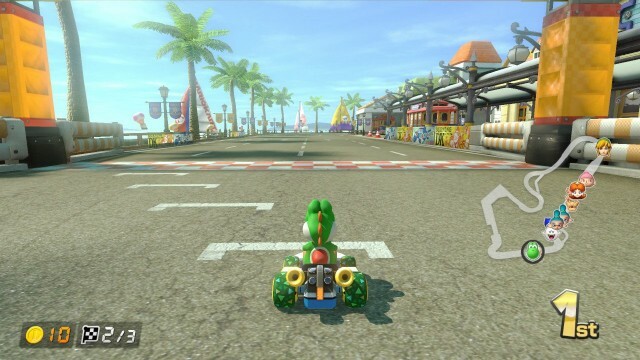 The original Mario Kart 8 had a lacklustre battle mode with standard race tracks, so the upgrades here are a major improvement. There is one new battle mode called Renegade Roundup which is basically like cops and robbers. One team has Piranha Plants (called the "Authorities") tries to capture the other team (the "Renegades") that has to avoid them, once caught they are put in "jail" and there is a key that can be hit to unlock the jailed Renegades. The battle ends when all the Renegades are caught, and the Authorities win, or when time runs out and the Renegades win. There are a few new items in MK8/MK8D, they include the Boomerang Flower, Potted Piranha Plant, Super Horn and specifically in MK8D the Cape Feather and Boo make their return. The Super Horn is the most powerful item that can even stop the Spiny Shells. The Boomerang Flower can be thrown 3 times, and Potted Piranha Plants will bite other racers and also pick up coins. While not new, probably the most overpowered and unbalanced item is the Bullet Bill, it can easily move someone up several places! It seems kind of unfair, but randomness is part of Mario Kart. Another significant change is having the ability to carry two items, which changes the racing dynamic quite a bit. For example, it allows a bit more aggressive play, as there is more incentive to use an item as opposed to keep an item on reserve for later in the race. There is also a new "super drift boost" that gives an even longer boost on a drift. Nintendo has also added smart-steering and auto-acceleration modes to make it easier for Mario Kart novices and kids. Smart-steering keeps the vehicle automatically on track, so that you won't fall off edges or go off road, one downside is that it will automatically skip shortcuts. But nonetheless this is a nice option from Nintendo to bridge a new audience into the Mario Kart series. Auto-acceleration will keep the vehicle always accelerating, it's good in that you don't have to keep your finger on the accelerate button, using this mode loses a bit of control therefore it's not that useful besides making it slightly more ergonomic when playing with a single Joy-con. 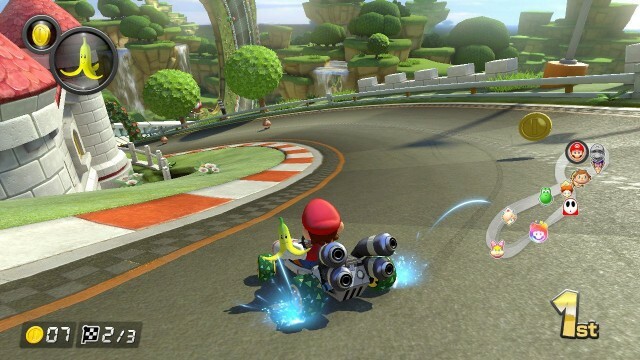 For more advanced players, MK8D continues to have a significant range of customization as there are three vehicle choices (karts, bikes and ATVs) and with a choice of wheels and gliders. Combine this with the different weight classes of characters, there is a great deal of experimentation and testing that players can do to find the best combination of speed, acceleration, weight, handling and traction. Online play is mostly unchanged from the Wii U game, up to 2 players can connect online as a party, to play VS races or battle mode with a matchmaking system. MK8D similarly utilizes the friend code system that is built in to the Switch, the online play system is barebones, but it works. Currently, the online capabilities are still free, but Nintendo has plans to turn this into a pay service. 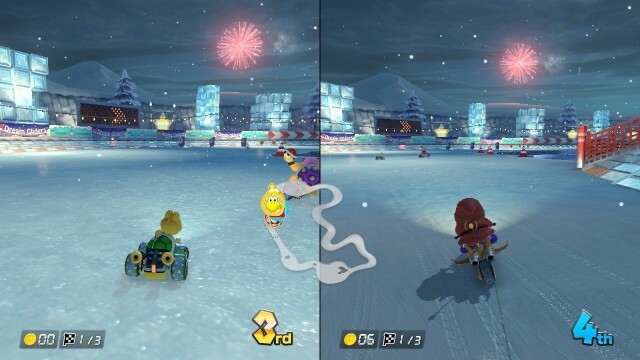 There are some graphical improvements on the Switch compared to the Wii U. Mario Kart 8 only ran at 720p on the Wii U, but on the Switch it runs at runs at 1080p in docked mode, which is a decent improvement. Overall, everything looks more crisp and smooth on the Switch, they definitely are not huge differences, but enough to be noticeable. Mario Kart 8 Deluxe can be played with a variety of control schemes: Two Joy-cons, single Joy-con, Pro Controller in both portable and docked modes. With a recent Switch update, GameCube controllers can also be used with a USB adapter, which is a great option for those that do not have a full set of Switch controllers for multiplayer games. Motion controls are enabled by default for turns, but it is better to disable that and only use the control stick, as it is far more precise. While Mario Kart 8 was a superb game for the Wii U - probably the best and most complete Mario Kart game released, but Mario Kart 8 Deluxe does not offer much extra besides the updated battle mode, and the convenience of having the game on a newer console - a discount for Wii U owners would have been a nice gesture. But for anyone that did not play the original game, Mario Kart 8 Deluxe is a game that is definitely worth playing.